The two fastest drivers, Spengler and Paffett, were followed by Jamie Green. 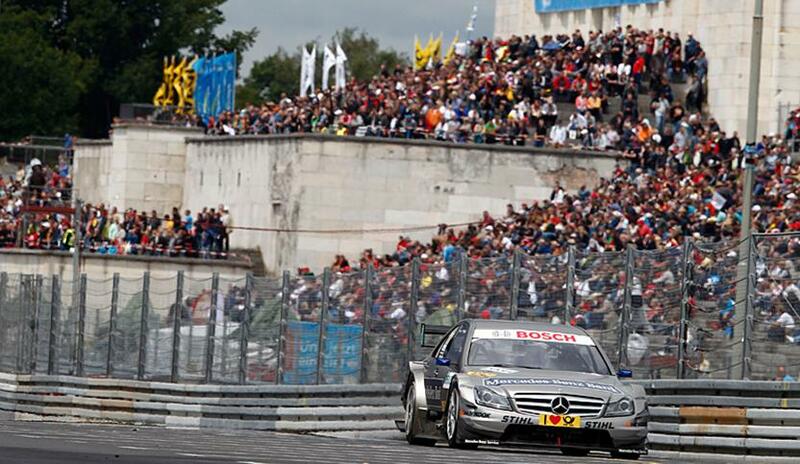 The Brit won at the Norisring in the past three years without having started from pole position once. Swede Mattias Ekström was the best-placed Audi driver on Sunday. With his Audi A4 DTM, the two times’ DTM champion will start the race from fourth place. “At the start of the lap, I already made a mistake, and that was it. At Norisring, getting everything spot-on is really difficult. Up to qualifying, we were successful, but unfortunately, we weren’t as it mattered. Too bad”, said Ekström. Ralf Schumacher (Mercedes-Benz), who claimed his maiden DTM pole position at the Norisring last year, will start from fifth place. His fellow Mercedes-Benz driver Maro Engel is the best-placed driver of a 2008-spec car and will be lining up alongside him. Timo Scheider (Audi), third in the points’ standings, will start from seventh place on the grid. Points’ leader Martin Tomczyk had a disappointment. The Audi driver, who won the races at Spielberg and Lausitzring, didn’t do any better than tenth in qualifying and thus scored his worst qualifying result of the current DTM season. “At Norisring, I have been struggling for years. There are days when things just don’t work, but tenth place is no disaster”, the German said. Mike Rockenfeller also had expected more from qualifying. The Audi driver, who was sidelined for one DTM race following his accident in the Le Mans 24 Hours and is making his “comeback” at Norisring, failed to find the right set-up and will start Sunday’s race from 17th place. The fifth DTM round of the year will cover 82 laps and a total distance of 186.5 kilometres. Due to the FIFA Women’s World Cup, the start is already at 13.00 h. ARD will be broadcasting live from 12.45 h.